Accepted Scientific Name: Mammillaria picta Meinsh. Origin and Habitat: Mammillaria picta is found at many locations throughout north-eastern central Mexico in the Sierra Madre Oriental mountains north and south of Cd. Victoria, where it occurs in the states of San Luis Potosi, Coahuila, Tamaulipas and Nuevo Leon. The species occurs over an area of more than 40,000 km2. This species is relatively common. Its estimated population size is more than 500,000 individuals. Altitude range: It occurs at elevations around 1,000-1,800 metres above sea level. Habitat and Ecology: This shadow-loving species is found on calcareous rock in semi-desert under the shade of shrubs (matorral xerófilo). 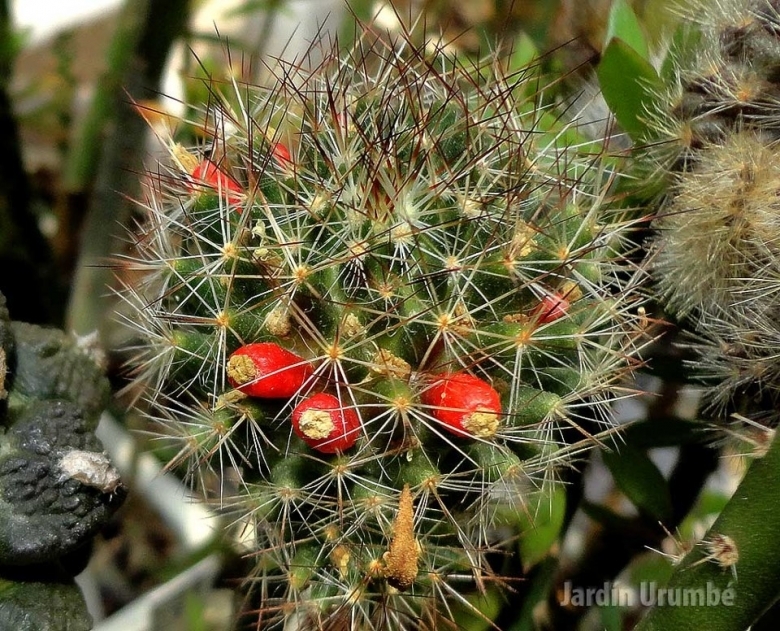 Accompanying cactus and succulent species can be: Mammillaria candida, Mammillaria roseoalba, Mammillaria baumii, Echinocereus blanckii, Pilosocereus palmeri and Echinocereus viereckii, Obregonia denegrii, Ferocactus echidne var. victoriensis, Neobuxbaumia euphorbioides, Echinocactus platyacanthus, Myrtillocactus geometrizans, Opuntia engelmannii, Opuntia imbricata, Opuntia kleiniae, Tillandsia usneoides, Selaginella lepidophylla, Agave salmiana, Agave lechuguilla, Dasylirion longissimum, Sabal pumos, Nolina stricta, Dioon edule and Yucca filifera. There is little interest in collecting this species and small consequent threat. Increased agricultural use and housing expansion also pose a small threat. Description: Mammillaria picta is a genuine winter-flowering species with greenish white blooms even in tiny seedlings. Tubercles: Cylindric-terete, somewhat oblique, obtuse, without latex, their axils with a few twisted hairlike bristles. Radial spines: (10)11-15(-20), protruding, bristle-like, pubescent yellowish at base, white near middle, above dark purple, brown or amber yellow to 10 mm long, lower (3-)4(-5) much longer, slender, hair-like and white. Central spines: 1 (rarely 2), to 10 mm long, erect, straight, brownish to dark brown, (not distinguishable in subsp. viereckii). Taxonomy: Mammillaria picta is quite variable and intergrades in habitat with Mammillaria carmenae by way of Mammillaria picta subs. viereckii and Mammillaria dumetorum, and with Mammillaria prolifera by way of Mammillaria albicoma. Mammillaria picta Meinsh. : (subsp. picta) has 1-2 central spines that can be distinguished from the 10-14 radials. 4) Edward F. Anderson (2001) “The Cactus Family” page 412. 5) Hernández, H.M., Gómez-Hinostrosa, C. and Goettsch, B. “Checklist of Chihuahuan Desert Cactaceae.” Harvard Papers in Botany 9(1): 51-68. 2004. 7) Fitz Maurice, B & Fitz Maurice, W.A. 2013. Mammillaria picta. The IUCN Red List of Threatened Species 2013: e.T62373A3113600. http://dx.doi.org/10.2305/IUCN.UK.2013-1.RLTS.T62373A3113600.en. Downloaded on 29 November 2016. Cultivation and Propagation: Mammillaria picta is an easy to grow species, just as a classic cactus, don't requires any special treatment, that seems to enjoy, in cultivation, good root space, and well drained compost, though it is not a quick grower. Repotting: Repotting every 2-3 years. Needs lots and lots of space to grow, use large shallow container or bowl filled with very porous compost. Use pot with good drainage. Watering: Water regularly in summer, but do not overwater (very wet-sensitively). Its roots are easily lost in pots that stay damp for any length of time. Keep dry with ample airflow in winter. In the rest period no high atmospheric humidity!! Care must be taken with watering as they tends to become swollen and untidy in growth habit if given too much water and shade. Propagation: By division, or direct sow after last frost. Seeds germinate in 7-14 days at 21-27° C in spring, remove the glass cover gradually as the plants develops and keep ventilated, no full sun for young plants! The seedlings should not be disturbed until they are well rooted, after which they can be planted separately in small pots. Cuttings: wait until the offsets that appear at the base of old clustered specimens are 1/3 the size of the parent and then detach and plant. Cuttings will take root in a minimum temperature of 20° C (but better in hot weather). Cuttings of healthy shoots can be taken in the spring and summer. Cut the stem with a sharp, sterile knife, leave the cutting in a warm, dry place for a week or weeks (depending on how thick the cutting is) until a callus forms over the wound. Once the callus forms, the cutting may be inserted in a container filled with firmed cactus potting mix topped with a surface layer of coarse grit. They should be placed in the coarse grit only; this prevents the cut end from becoming too wet and allows the roots to penetrate the rich compost underneath. The cuttings should root in 2 to 6 weeks.